This picture shows the sheerlegs by the bridge, and the sea cadets out in a "whaler". The vessel on the left is the "Result" which was a fairly regular visitor. 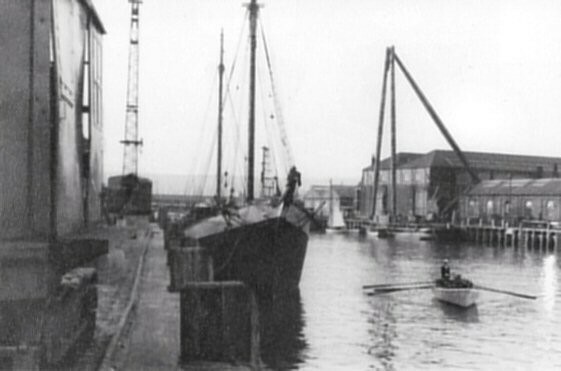 She is moored at the jetty near to where the sheet loft had been, and by the look of the cranes was being used as a ballast wharf at this stage. This page was added by John Sweatman on 13/03/2010. This shot showing the Sea Cadets' whaler, pulling crew was taken when Newhaven Sea Cadet Unit, was very prominent in whaler and particularly ASC pulling events, where they won many trophies for the unit during mid 1960's era. I was in the sea cadets from 1955 to 1959 and went to many whaler races. There was always one on Boxing Day at the Hove Lagoon. I went several times to Ravens Ait for weekend training and boat sailing also. John, are you related to Mr Sweatman who was an officer in the cadets and who had the record shop in South Road? Hi David Yes, he was my uncle. I'm adding a page which has you in a pulling team. Thank you John, I have seen the photos, it is good you have kept them to remember all those good times. I hope you are keeping well.